I received this book for free from Tanglewood Press in exchange for an honest review. This does not affect my opinion of the book or the content of my review. 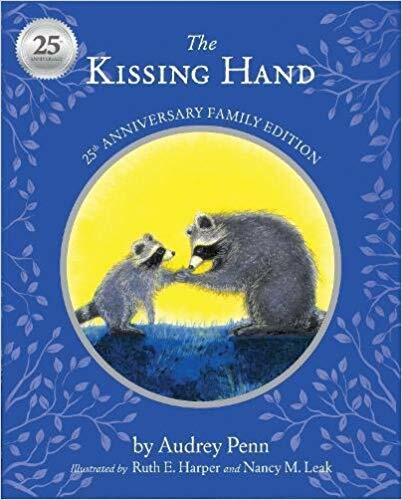 A well know classic, The Kissing Hand has released their 25th anniversary collector’s edition. With a beautiful hardbound cover, heart shaped stickers and a place to write special memories, it’s a perfect gift. The message is one of comfort after separation and a mother’s love. This has been a family favorite for years! Audrey Penn started her career as a ballerina dancing with the National Ballet, New York City Ballet, Stuttgart Ballet, and the Danny Diamond Dance Theatre. In 1980, she became too ill with Juvenile Rheumatoid Arthritis (JRA) to continue dancing but, because she had participated in children’s theatre, children’s dance, and always enjoyed children’s literature, she turned to writing children’s books for her creative outlet. Her passion for advocacy for children continually molds her writing style and subject matter. She has created her writing program – The Writing Penn – into schools, libraries, and children’s hospitals, where she shapes and refines her story ideas in partnership with kids. Today, Audrey has written over 13 books and is a New York Times bestselling author of The Kissing Hand.